We’ve had our Australian Shepherd puppy Solo for three months now and we’ve been wanting to sign him up for some puppy classes. We train him on our own but there are a few things, such as light biting, jumping on strangers, pulling on a leash, and not always obeying us, that we want help in improving. In Grenoble they offer free lessons with a trainer who we went to see two weeks ago. The only thing they ask in return is for dog owners to help keep the city clean by picking up dog poop; easy enough since we already do that. From the moment we met the trainer I was already getting a weird vibe from him, and then I found out why. He’s an older man who believes in negative reinforcement when it comes to dog training. That’s not how we’ve been training Solo and I haven’t read anything encouraging owners to train that way. The only lesson we had was leash training, and his method was to walk with the dog and when he strays too far from you you yank the leash back until the dog is at your side. One time he did this too harshly with Solo and he yelped. I don’t see how that is good for the dog’s neck or how that’s supposed to encourage the dog to trust you or obey you when he’s not on the leash. Needless to say, we decided right when we left that we were not returning. So this past week we contacted another trainer, who owns an Australian Shepherd herself and who uses clicker training coupled with positive reinforcement. She came over to our apartment to meet us and Solo and she gave us a lot of helpful information. Solo, like with every other living thing he encounters, liked the trainer right away, especially after she gave him lots of treats! We’ll be meeting with her once a week now and hopefully Solo will be able to do everything that the trainer’s own dogs do (the trainer’s website had demonstration videos with her Aussie walking at her side all over town, crossing the street when told instead of darting across, and even waiting outside by herself while the trainer was in the bank)! She was impressed with Solo–mainly his size!–when she met him, since he already knows quite a few commands. 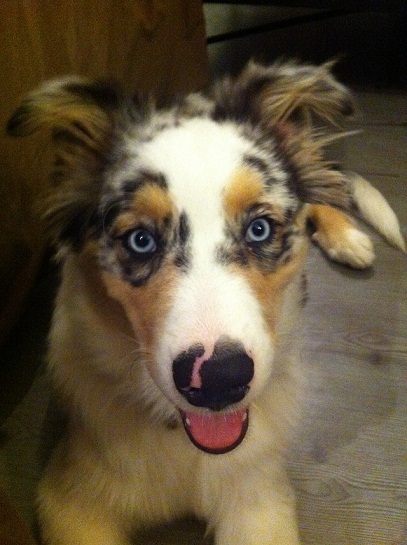 He’s a smart dog and Aussies are a smart breed so we know he’ll benefit from puppy training a lot. One thing is for sure: owning a puppy requires a lot of patience! Having Solo is definitely helping us prepare for parenthood one day. Our 5 month old Australian Shepherd puppy, Han Solo. We call him Solo for short.